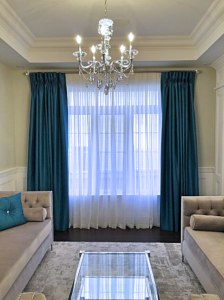 Solid bold drapes are a safe option when patterns have already been introduced to the room because they provide a balance in the room. 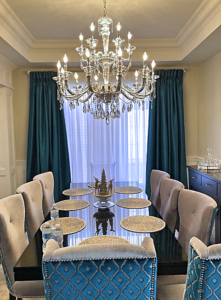 If your goal is to make a statement, choosing bold or bright drapes will definitely help you achieve your goal, however its always best to choose a colour that will coordinate well with some other decor you have in the room. In this living room & dining room, the chair decor had a beautiful pattern with a bold teal for a touch of colour. 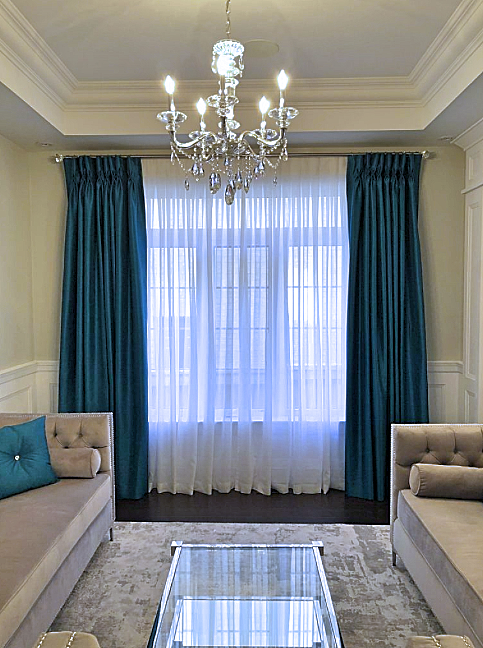 We used a perfect teal silk material to match and compliment the room. How else to make a statement? in addition to the drapery we used sheer curtains behind the drapery panels. 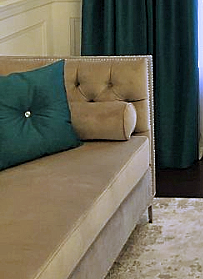 For our final touch, we custom made pillows using the same silk material used for the drapery to decorate. Never be afraid to use bold colours even if a simple statement you are aiming for!